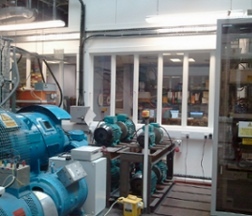 The Institute for Energy and Environment at the University of Strathclyde offers the experimental facility "Distribution Network and Protection Laboratory", D-NAP. This comprises a 100kVA microgrid that can operate grid connected or variously islanded, integrated with a real-time digital network simulator and protection injection laboratory. The facility offers hardware-in-the-loop capability, and incorporates induction machines, programmable load banks and various 1/3 - phase inverters. The facility has also been expanded to incorporate a communications system simulator allowing new smart grid technologies to be hardware tested with realistic communications incorporated. The D-NAP facility can be used for hardware in the loop (HIL) simulation, preset scenario playback and demonstration of system behaviour in islanded mode. Different demonstrations and tests can be performed in each mode. For instance, using HIL it is possible to demonstrate a small network and distributed resources attached to a much larger electrical network, for instance the utility grid. The facility is connected electrically to a number of other on-site laboratories including a fuel cell test laboratory, a demand response laboratory and also a gas engine. These laboratories are used to demonstrate storage and demand side management algorithms and control strategies. The laboratory has a capability to discharge batteries through the inverter system in the microgrid laboratory at up to 700VDC. Furthermore it is possible to integrate via communication networks with offsite DER and DSM systems. The laboratory has been used to develop new analytical methods for electrical measurement (e.g. improved Rate of Change of Frequency, ROCOF) within dynamic environments with harmonic contamination. It is also been used to investigate security of supply, distributed generation control, demand side management system integration, microgrid coordination, and protection algorithms, along with testing communications systems for the smart grid. More information can be found at www.strath.ac.uk/eee/research/iee/.